Let me tell you why you NEED these in your life. They are delicious, filled with amazing nutritional value and will truly wow you’re guests and yourself after you have a slice of this all time brunch favorite! You will not be disappointed. Catch the short video of how I made it and “enjoy” the background classical music @winecoach insisted on playing as I made us brunch on Valentine’s day! Keeping it classy for you guys! Mix together all wet ingredient minus the shredded green apple. Add dry mixture to wet until well incorporated, only then adding shredded apples. The batter will be thick. Preheat waffle iron and prepare it with coconut oil spray. Spoon batter into waffle and prepare according to manufacturer’s instructions. Should yield 4 large waffles or 8 standard waffles (I used a heart shaped waffle iron because it was Valentine’s Day! 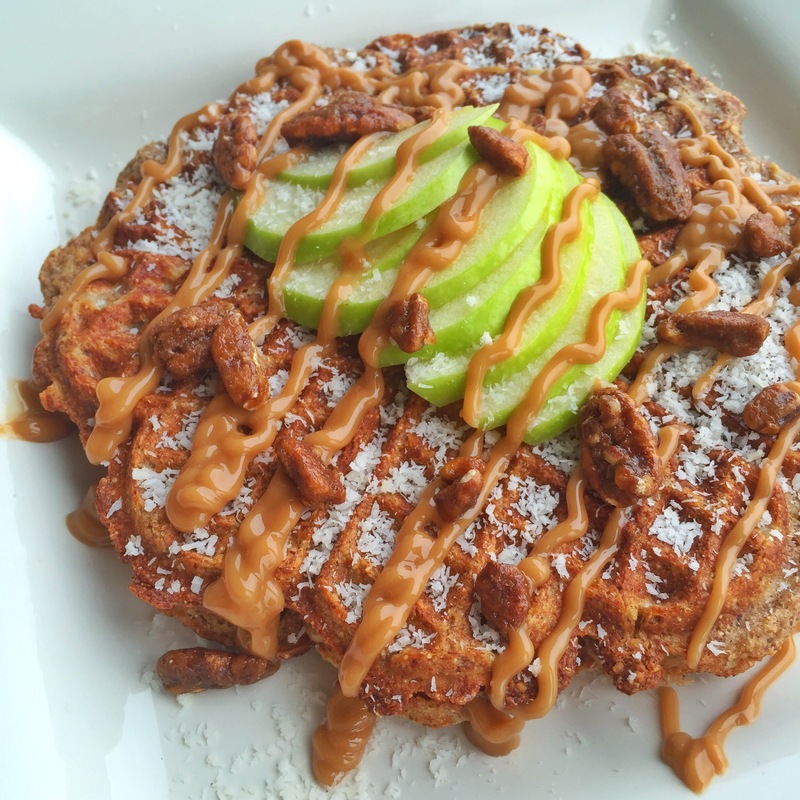 Top your waffles with almond butter, sprinkle shredded coconut, pecans pieces and drizzle with caramel sauce and fresh apples on top! Maple syrup is optional and a delicious addition. I’m in love with these waffles. 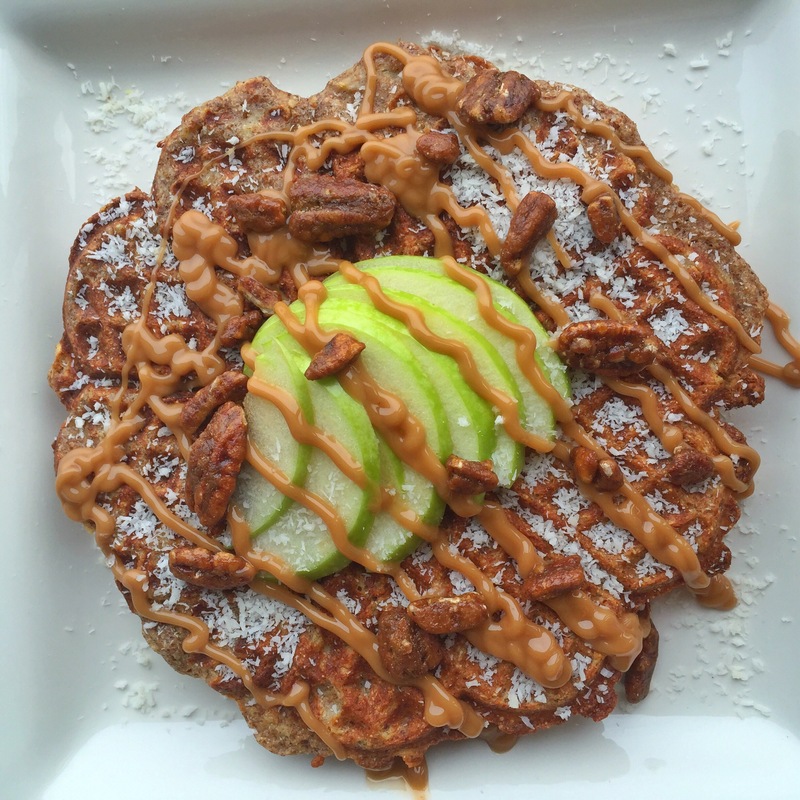 I already knew apple and cinnamon went together, but the use of coconut milk in the batter and shredded coconut as a topping made it a home run for sure. Refrain from substituting those ingredients for optimal results! I hope you make it and enjoy it as much as I did! 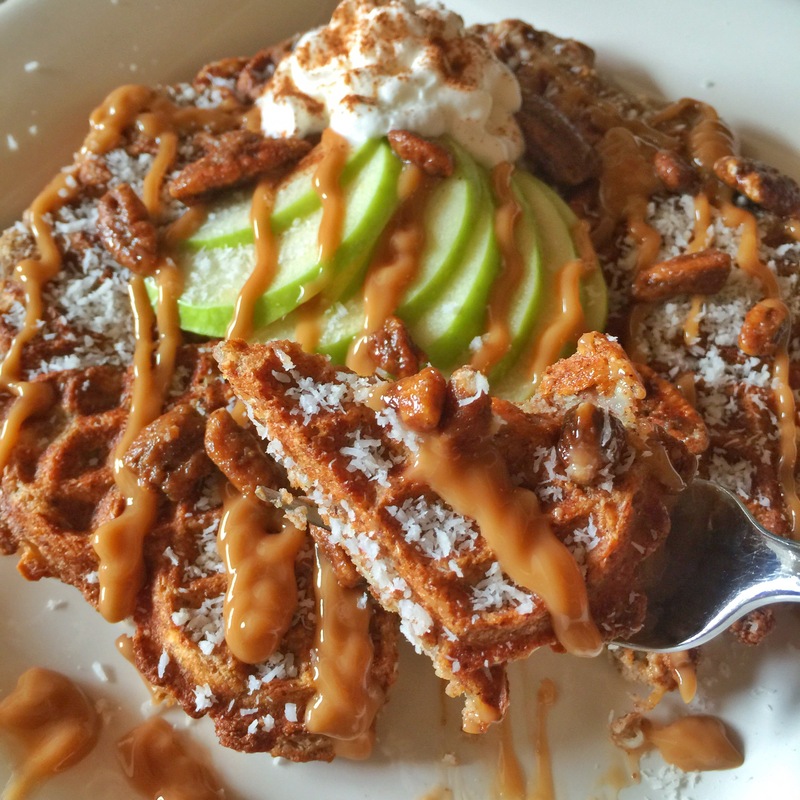 This entry was posted in Brunch It On Sundays, Brunch it on Sundays, Cakes and Breads, Sweet Stuff, Waffles and tagged apple cinnamon waffles, cinnamon apple waffles, healthy waffles. This is good stuff Olivia!!! ???? thanks doll! can i not use the apple shreds in this recipe? thanks! Right??? I get amazed by this stuff sometimes! Hi, I’m Dana! I create simple, delicious recipes that require 10 ingredients or less, one bowl, or 30 minutes or less to prepare. Am I able to store in the fridge leftover waffle or pancake batter? Yes for up to 2 days. Otherwise make the actual pancakes or waffles and freeze them. Warm them up when you are ready to eat them again! Thank you for this… ???? My pleasure! Love to share with you! Excited to try these soon! Do you recommend a specific brand of almond butter? I use maranatha or 365 from whole foods. Any brand will do or you can even blend your own. I do that sometimes! I hope you make it, is me know how it turns out! What can you use in place of the greek yogurt that would be dairy free? thanks! Oh my, these are fantastic! I used oat flour instead of whole wheat and 1/4 applesauce instead of the yogurt and they were SO good. These are our new fav! Yay I’m so happy about that!!! Thanks for letting me know!